I am sure those of us who attended the Volunteer Interaction today felt energized and inspired. At least I did. Here is what happened for those who missed it! Around 26 of us arrived at the center for a completely informal interaction session. The agenda of the meeting was clear- a platform for volunteers to meet each other, discuss and tell about their challenges, find solutions for the challenges, discuss about funds for LEAD, Joy of Giving Week and how we can help LEAD do better, reach more people.. The session started with a fun game- Names, names- Everyone will say, "Names, Names we all have name, you tell yours and we will tell the same (with actions :) Each participant has to tell his/her name and plan an action rhythm, others have to imitate the action. It was wonderful to see the smiles, laughter that our gestures brought. Ameeta mam with her unique storytelling abilities, told an inspiring story - The Daffodil story. A story about how a single woman transformed a barren landscape into a beautiful meadow filled with different colored daffodils. The lady worked tirelessly since 1958 to make her vision of beauty and celebration come into reality by planting over 50,000 bulbs, her mantra- "One bulb at a time". The story touched deep chords- It spoke about having a dream, a vision, working tirelessly for the vision. Never being overwhelmed by the task ahead but taking things as they come..and the best of all- Its never too late to make a change, start today don't fret about not doing it yesterday. This was followed by introduction with the contribution to LEAD as well as the challenges faced by each of us. It was wonderful to see how we all came to LEAD through various ways and how each of us contributed to LEAD and how LEAD contributed to our lives. Solution: Handling them LEAD's visiting cards with the website address and telling them to check and get back and contact the numbers given, sticking a note outside with contact detail of Rupesh/ Kailash and website detail. If they are genuine they will do so and come back, if they don't; we lose nothing. Solution: We all have a group of close friends, we can ask them for tea one day and talk to them passionately about LEAD. Our friends know us well and seeing our passion and love, show genuine interest. Solution: Since many volunteers already do fieldwork, there is enough goodwill in the community. In order to make them come on time we have to consistently apply reinforcement strategies- giving stars/ stamps on good behavior, taking away stars on unwanted behavior. They should be told one with maximum stars will get to sit with the teddy, or will be appreciated in front of the class. We can make the elder kids (Maruti, Suresh) responsible by making them Leaders of their groups. They will be responsible for specific activities- on field visit/ sports/ hygiene/ discipline etc. We need to star a mentor program with the kids- some young volunteers can select and mentor a child especially elder children and talk to them as friends. They need to be shown dreams, ways to achieve them so that kids are inspired and study hard. On the same lines we can have practical visits to offices to show them how people work and how they can get here. We can tell them "you need to clear board and go to junior college, graduate and then get a job like this, you can do this". A file for each child, in order to make parents of our kids more supportive and committed to educate their children, we need to show how good their children are doing, this by monthly meeting with parents where we show a file with their kids work- art, craft, studies. 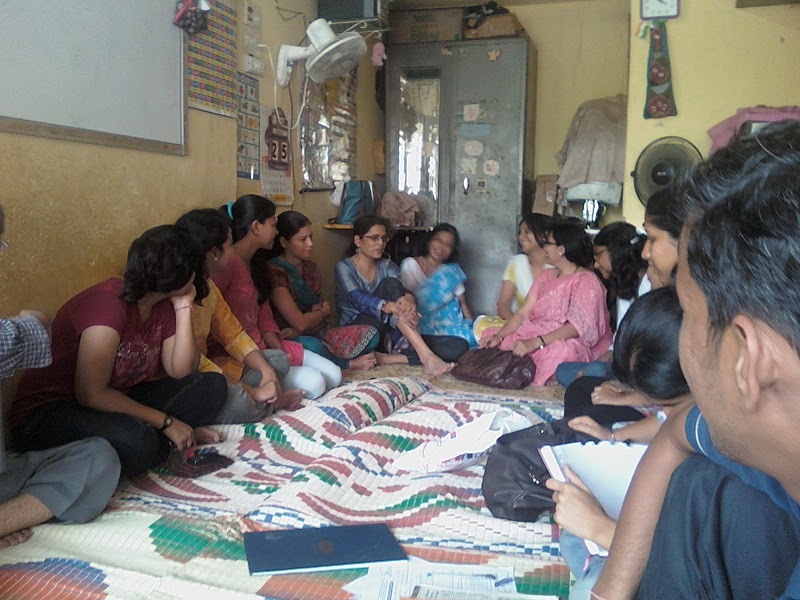 After this discussion, Rupesh told us about the monthly expenditure for LEAD's three centres- Rs. 25,000 and how we need to raise this money through different activities. -We require more people to forward the proposals we have created for schools and colleges and give us more ideas and avenues for corporate activities. Just visit a school near you and take the print out of joy of giving letter, i will be sending and tell them to give us at least an hour. -Kamlesh one of our volunteers has come up with an ingenious idea to create awareness and bring more people in LEAD. He has initiated a 'Ride for a Change' where riders will go on a trip to Malsej Ghat and they can contribute whatever they feel like for the cause. So we have many ways of raising funds, we just need to start spreading the word!